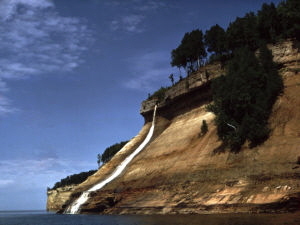 There are a total of 197 known waterfalls in Michigan’s Upper Peninsula. These waterfalls are beautiful in all seasons. The ice formations created in winter are spectacular while the flora and fauna during the summer add special touches. The greater water flow after snow-melt in spring and in the rainy periods in fall make the falls most impressive. The jewel of Michigan’s Upper Peninsula is the majestic Upper Tahquamenon Falls. It is one of the largest waterfall east of the Mississippi River. It has a vertical drop of nearly 50 feet and is more than 200 feet wide. 18 Mile Rapid Falls, South Branch of Ontonagon River, 5.5 miles South of Ewen. Alder Falls - Alder Creek. 2.5 miles southeast of Big Bay. 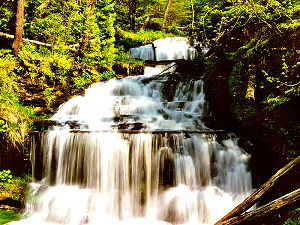 Alger Falls - Alger Creek. 1 miles south of Munising at intersection of M-94 & M-28. Access: Improved Trail. Walking Time: 15 minutes or less. Vertical Drop: 20 feet and over. Algonquin Falls - Black River. 9.5 miles north of Bessemer. Au Train Falls - Au Train River. 8 miles south of Au Train or 1 mile north of M-94 on Power Dam Road. Access: Improved trail. Walking Time: 15 minutes or less. Vertical Drop: 5-20 feet. Big Falls - East Branch of Huron River. 7 miles southeast of Skanee. Big Pup Creek Falls. 4 miles south of Big Bay. Access: Unimproved Trail. Walking Time: 15 minutes or less. Vertical Drop: 20 feet and over. Black River Falls - Black River. 8 miles southwest of Ishpeming. Access: Unimproved trail. Walking Time: 15 minutes or less. Vertical Drop: 20 feet and over. Boney Falls Dam. Escanaba River. 9.5 miles west of Perkins. Bridalveil Falls - Photographs of Bridalveil are featured on several postcards from the area but the falls are only viewable by water or from a distance at Miners Castle. 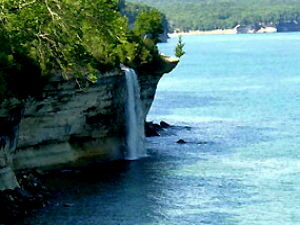 The falls are northeast of Miners Beach .6 miles. The falls are not viewable from the North Country Trail. Bridalveil is a seasonal waterfall which slows to a trickle in summer and fall. Pets are NOT permitted on the North Country Trail. Brule Island Dam. Brule River. 12 miles southeast of Crystal Falls. Bushy Creek Falls. Bushy Creek. 5.5 miles southeast of Big Bay. Carp River Falls: 2.5 miles southwest of Marquette. Access: Unimproved trail. Walking Time: 15 minutes or less. Vertical Drop: 5-20 feet. Cataract Dam Falls. Escanaba river. 3 miles northwest of Princeton. Chandler Falls - small stream off Escanaba River. 3 miles southwest of Gladstone. Chapel Falls - Munising. Off H-28 in Pictured Rocks National Lakeshore between Miners & Sable Falls. Access: Improved trail. Walking Time: 45 minutes or more. Vertical Drop: 20 feet and over. A1.5 mile trail leads to Chapel Falls from the Chapel Trailhead. This trails in on and old roadbed with several small hills. Two Viewing platforms along the way provide views of the Chapel Basin. Chapel Falls cascades some 60 feet down the sandstone fliffs on it way to Chapel Lake. Pets are not permitted on this trail. Chappee Rapids - Menominee River. 5 miles northwest of Menominee. Chicagon Falls - Cicagon Creek. 7 miles northwest of Crystal Falls. Chipmunk Falls - Net River. 6.5 miles northwest of Amasa. Chippewa Falls - Black River. 9 miles north of Bessemer. Daults Falls - Daults Creek. 2.5 miles southeast of L’Anse. Dead River Falls - 3 miles northwest of Marquette. Access: Unimproved trail. Walking Time: 15 minutes or less. Vertical Drop: 5-20 feet. Deer Creek Falls - Deer Creek. 7 miles northwest of Bergland. Frohling Falls - 6 miles north of Little Lake. Access: Unimproved trail. Walking Time: 15 minutes or less. Vertical Drop: 5 feet and under. Garbo Falls, Black River, 2 miles North or Ramsay. Gorge Falls. Black River, 10.5 miles north of Bessemer. Access: Improved trail. Walking Time: 15-45 minutes. Vertical Drop: 20 feet and over. Granite Rapids Falls, Black River, 2 miles Southwest of Ramsay. Great Conglomerate Falls. Black River, 10 miles north of Bessemer. Access: Improved trail. Walking Time: 15-45 miles. Vertical Drop: 20 feet and over. Greenwood Falls. Big Iron River, 4 miles north of White Pine. Access: Unimproved trail. Walking Time: 15 minutes or less. Vertical Drop: 5-20 feet. Haymeadow Falls - Rapid River. 8.5 miles north of Rapid River. Hemlock Falls Dam - Michigamme River. 11 miles north of Crystal Falls. Hemlock Rapids - Paint River. 2.5 miles southwest of Amasa. Horse Race Rapids - Menominee River. East Kingsford. Horserace Rapids. Paint River. 7.5 miles southeast of Crystal Falls. Iagoo Falls. Presque Isle River. 11 miles north of Thomaston. Interstate Falls. Montreal River. 2 miles northwest of Ironwood. Irish Rapids Falls. Ontonagon River. 2 miles northwest of Rockland. Jacobs Falls: Approximately 3 miles northeast of Eagle Harbor. Access: Unimproved trail. Walking Time: 15 minutes of less. Vertical Drop: 20 feet and over. Judson Falls. Slate River. 6 miles east of Marenisco. Jumbo Falls. 1.5 miles west of Kenton on M-28, 1.5 miles south of FR-4580 approximately 0.5 miles east on gravel road, turn sout to gravel pit. Access: Little or no trail. Walking Time: 15 minutes or less. Laughing Whitefish Falls. 2 miles south of Sundell. Access: Unimproved trail. Walking Time: 15-45 minutes. Vertical Drop: 30 foot. Lepisto Falls. Presque Isle River. 10 miles north of Thomaston. Little Bull Dam. Paint River. 6.5 miles southeast of Crystal Falls. Little Falls. Middle Branch of Ontonagon River. 4 miles southeast of Paulding. Little Garlic Falls. 11 miles northwest of Marquette. Access: Unimproved trail. Walking Time: 45 minutes or more. Vertical Drop: 5-20 feet. Little Rapids. St. Marys River. 3 miles east of Sault Sainte Marie. Little Trap Falls. Anderson Creek. 6.5 miles north of Bergland. Little Union Gorge Falls. Little Union River. 2.5. miles southwest of Silver City. Lower Dam Falls. East Branch of Ontonagon River. 4.5 miles southwest of Sidnaw. Manabezho Falls. Presque Isle River, 10 miles north of Thomaston. Access: Improved trail. Walking Time: 15 minutes or less. Vertical Drop: 20 feet and over. Manakik Falls, Maple Creek, 11 miles Northwest of Bessemer. Margeson Falls, Margeson Creek, 9 miles Northeast of Crystal Falls. Meepikon Falls. Black River. 1.5 miles north of Ramsay. Memorial Falls. Tannery Creek. Munising. Miners Falls. Munising. Within the Pictured Rocks National Lakeshore. 3.5 miles north of H-58 on Miners Castle Rock. Access: Improved trail. Walking Time: 45 minutes or more. Vertical Drop: 20 feet and over. This self-guided interpretive trail is 1.2 miles long. The trail ends at Miners Faalls with view of the Miners Basin along the way. There are 77 steps leading down to the viewing platform at the falls where the Miners River cacades some 50 feet over the sandstone outcrop. Please stay on the paved trail. Pets are not allowed on this trail. Morgan Falls. Morgan Creek. 3.5 miles southwest of Marquette. Access: Unimproved trail. Walking Time: 15 minutes or less. Vertical Drop: 5-20 feet. Mosquito Falls. Mosquito River, 10.5 miles northeast of Munising. Access: Improved trail. Walking Time: 45 minutes or more. Vertical Drop: 5-20 feet. This waterfall is accessible for Chapel Trailhead. Walking to Mosquito Beach, a side trail leads l9. miles to the falls which drops over an 8 foot high rock shelf on the Mosquito River. Watch for river otter and beaver in the stream. Pets are not permitted on this trail. Munising Falls - Walk the paved. 25 mile trail up the cool, shaded sandstone canyon along Munising Creek to the falls. Two sets of stairs lead to elevated platforms enabling views of the 50 foot waterfall which drops over a sandstone cliff. Watch for terns, wildflowers, and a occasional mink. The trai is fully accessible to the central falls viewing platform. Please stay of the paved trail. Pets are permitted on this trail. Niagra Dam. Menoniniee River. 2 miles south of Quinnesec. Nimikon Falls. Presque Isle River. 13 miles west of Bergland. No Name Falls. Sturgeon River. 4 miles south of Herman. Nokomis Falls. Presque Isle River. 10 miles north of Thomaston. Ogima Falls. Copper Creek. 10 miles north of Thomaston. Oginakwe Falls. Baltimore River. 8 miles north of Thomaston. Onion Falls. East Branch of Ontonagon River. 7 miles northwest of Kenton. Penene Falls. Menominee River. 6.5 miles south of Faithorn. Access: Little or no trail. Walking Time: 15 minutes or less. Vertical Drop: 5-20 feet. Pinnacle Falls Dam. Yellow Dog River. 8 miles southwest of Big Bay. Potawatomi Falls. Black River, 10.5 miles Bessemer. Access: Improved trail. Walking Time: 15 miles or less. Vertical Drop: 20 feet and over. Powderhorn Falls. Powder Mill Creek. 2 miles northwest of Bessemer. Quiver Falls. Menominee River. 4 miles southwest of Loretto. Rainbow Falls. Black River, 12 miles north of Bessemer. Access: Improved trail. Walking Time: 15-45 minutes. Vertical Drop: 20 feet and over. Rapid River Falls. 7 miles north of Rapid River on west side of US-41. Access: Little or no trail. Walking Time: 15 minutes or less. Vertical Drop: 5 feet and under. Small flat rock falls on the Rapid River. Picnic area available in county park. Serene, tranquil, and enjoyable spot to visit. Reamy Falls. 5 miles northwest of Marquette. Access: Little or no trail. Walking Time: 15 minutes or less. Vertical Drop: 5-20 fee. Rock River Falls. Three miles south of Chatham on FR-2279 then south on FR-2293 one mile. May have to walk entire distance on on FR-2292. Half mile steep walk down to falls. Rocky Forty Falls, Siemens Creek, 3.5 miles Northwest of Bessemer. Rudolph Olson Memorial Falls. 1.2 miles northeast of Munising at intersection of H-58 & Washington Street. Access: Unimproved trail, Walking Time: 15 minutes or less. Vertical Drop: 5-20 feet. Sable Falls. 1.5 miles west of Grand Marais on H-58. Access: Improved trail. Walking Time: 15 minutes or less. Vertical Drop: 20 feet and over. Sandstone Falls. Black River, 12 miles north of Bessemer. Access: Improved trail. Walking Time: 15-45 minutes. Vertical Drop: 20 feet and over. Saxon Falls, Montreal River, 11 miles Northwest of Ironwood. Scott Falls. South side of M-28, east side of Lake Superior’s Au Train Bay. Access: Unimproved trail. Walking Time: 15 minutes or less. Vertical Drop: 5-20 feet. Shining Cloud Falls. 9 miles west of White Pine. Carp River, 21 miles north of Thomaston. Access: Improved trail. Walking Time: 45 minutes or more. Vertical Drop: 20 feet and over. Sparrow Rapids. East Branch of Ontonagon River, 1.5 miles northwest of Kenton. Access: Improved Trail. Walking Time: 15 minutes or less. Vertical Drop: 5 feet and under. Spray Falls - This remote waterfall is best viewed by boat for Lake Superior as it is not accessible on the North Country Trail. Spray Falls is 1.75 miles northeast of Chapel Rock. The 1856 shipwreck “Superior” lies at the base of the falls in 20 feet of water. Pets are not permittedd on the North Country Trail. Sturgeon Falls. Sturgeon River, 9 miles north of Sidnaw. Access: Improved Trail. Walking Time: 15-45 minutes. Vertical Drop: 20 feet and over. Sturgeon Falls Dam. Menoninee River, 3.5 miles southwest of Loretto. Access: Improved trail. Walking Time: 15 minutes or less. Vertical Drop: 5-20 feet. Superior Falls. Montreal River. 14.5 miles north of Ironwood. Three Rapids Falls. Middle Branch of Ontonagon River. 6.5 miles north of Bruce Crossing. Tibbets Falls. 2 miles west of Covington, turn north on Plains Road. Access: Unimproved trail. Walking Time: 15 minutes or less. Vertical Drop: 5-20 feet. Traders Falls. Little Carp River, 20 miles north of Thomaston. Access: Improved trail. Walking Time: 45 minutes or more. Vertical Drop: 5 feet and under. Trappers Falls. Little Carp River, 17 miles north of Thomaston. Access: Improved trail. Walking Time: 45 minutes or more. Vertical Drop: 5-20 feet. Twin Falls. East Branch of Salmon Trout. 5.5 miles west of Big Bay. Twin Falls Dam. Menominee River. Northwest of Menominee. Unnamed Falls. 2.5 miles southwest of Marquette. Access: Unimproved trail. Walking Time: 15 minutes or less. Vertical Drop: 5-20 feet. Unnamed Falls. Menominee River, Between Hydraulic Falls Dam & Piers Gorge on Menominee River. 1 mile south of Quinnesec. Access: Little or no trail. Walking Time: 45 minutes or more. Vertical Drop: 5 feet and under. Upper Falls. Sturgeon River. 1.5 miles from Alberta. Upper Falls. Salmon River. 6 miles west of Big Bay. Upper Leatherby Falls. West Branch of Huron River. 8.5 miles southeast of Skanee. Upper Silver Falls. Silver River. 2 miles from Herman. Upper Tahquamenon Falls. 14 miles west of Paradise on M-12. Access: Improved trail. Walking Time: 15 minutes or less. Vertical Drop: 20 feet or more. Victoria Dam Falls. West Branch of Ontonagon River. 4 miles southwest of Rockland. Vista Falls [Waterfalls]. West Branch of Sturgeon River. 5.5 miles southwest of Nisula. Wagner Falls. 5 miles south of Palmer on M-35. Access: Little or no trail. Walking Time: 15 minutes or less. Vertical Drop: 20 feet. West Branch Falls. West Branch of Huron River. 6 miles southeast of Skanee. West Sturgeon Falls [Waterfalls], West Branch of Sturgeon River, 3 miles South of Nisula. White City Falls. Middle Branch of Escanaba River. 7.5 miles southwest of Ishpeming. Whitefish Falls. 4 miles northeast of Trenary on west side of US-41. Access: Unimproved trail. Walking Time: 15 minutes or less. Vertical Drop: 5-20 feet. Wolverine Falls. Cisco Branch of Ontonagon River. 8 miles west of Paulding. Wyandotte Falls [Waterfalls], Misery River, 1.5 miles southwest of Twin Lakes. Phone: (906) 337-4579 Access: Unimproved trail. Walking Time: 15 minutes or less. Vertical Drop: 5-20 feet. Yellow Dog Creek. 5 miles south of Big Bay. Access: Little or no trail. Walking Time: 15-45 minutes. Vertical Drop: 5-20 feet. Yondota Falls. Presque Isle River, 3 miles north or Marenisco. Access: Improved trail. Walking Time: 15-45 minutes. Vertical Drop: 5 feet and under.